Now we’re into the 2nd era of the Diablo. Or you could say the 2nd era part 2. 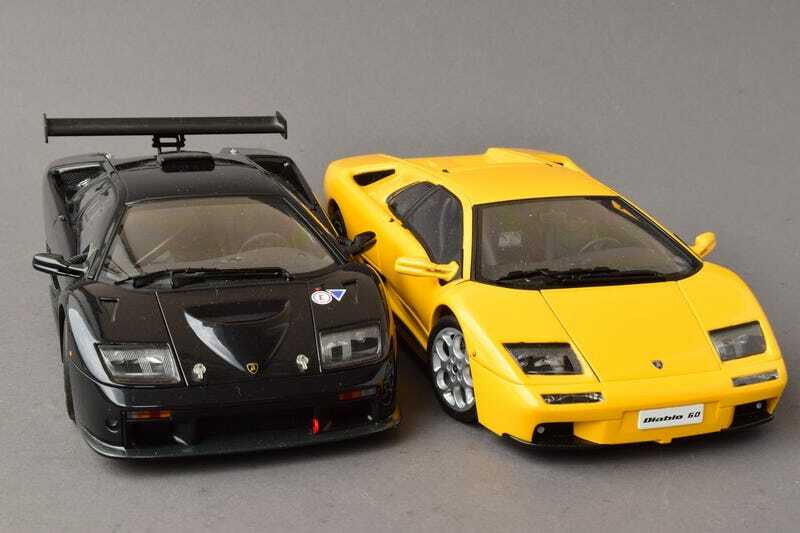 You see the facelifted Diablo, most easily identified by switch from pop-up headlights to units from the Nissan 300ZX, was developed while Lamborghini was under Indonesian ownership. But these 2 models, the VT 6.0 and GTR came under Audi’s ownership. Compared to the facelifted 1998 model, the 6.0 featured a smoother front end design and the 3-piece wheels were dropped for monobloc units. Oh, and the 5.7l V-12 was stroked-out to 6 liters, which I believe is what that 6.0 in the name is for. That 6 liter engine was essentially carried over from the Diablo GT. That same motor was also used in the race ready Diablo GTR. Introduced in 1999, the GTR borrowed its design from the Diablo GT, though it brought its own party favor in the form of its chassis-mounted rear spoiler.